Chemotherapy is often used for symptomatic metastatic salivary gland tumors; chemotherapy leads to a modest but meaningful response ranging from 15% to 40% depending upon the agent used and whether single or multidrug combination is used. Due to a paucity of randomized controlled trials evaluating the role and choices of chemotherapy regimens in salivary gland tumors, there is no clear consensus regarding the degree of benefit, the specific drugs and doses, and the best combination therapies. We searched through all available ongoing registered clinical trials evaluating the question of choice of chemotherapeutic, targeted, hormonal, and immunotherapeutic regimens in recurrent metastatic salivary gland tumors. We summarize the results with regard to their use in the current oncology practice. We accessed the online available database of privately funded and public-funded clinical studies conducted around the world at https://clinicaltrials.gov/, which is maintained by the National Library of Medicine at the National Institute of Health. This website contains summary information on study participants and study outcomes including adverse events for clinical trials registered in its database. We used the search terms 'salivary gland tumors' and 'salivary gland cancer' under disease or condition, without any filters. The studies selected for the current review included Phase III, Phase II, and Phase I with Phase II extension trials, including chemotherapy, hormonal therapy, targeted therapy, and immunotherapy in recurrent metastatic salivary gland tumors. All trials registered but withdrawn, prematurely terminated, or trials with unknown status were excluded from the final analysis. We included in the final list all these ongoing, completed, active (nonrecruiting and recruiting) clinical trials except for the pure Phase I dose finding/maximum tolerated dose (MTD) trials that had been excluded. The above search using 'salivary gland tumors' and 'salivary gland cancer' as the search terms yielded 189 clinical studies. Among these, 83 clinical trials were evaluating the use of chemotherapy, hormonal therapy, targeted therapy, or immunotherapy in recurrent metastatic salivary gland tumors. We excluded 30 trials due to status unknown (5), withdrawn (6), prematurely terminated (9), and pure dose finding/MTD Phase I trials (10). 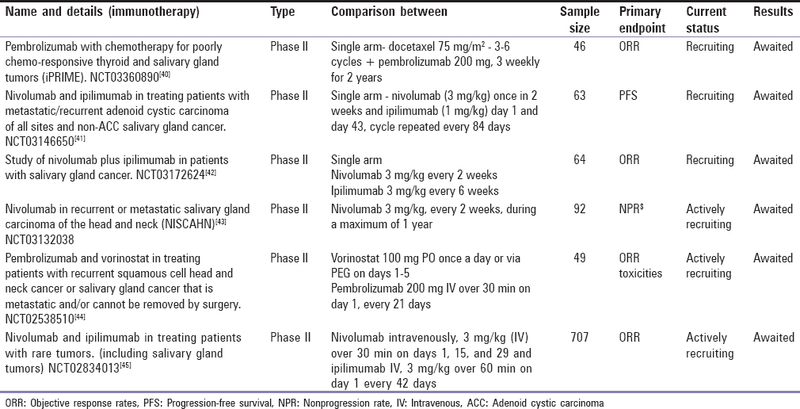 The final list included 53 clinical Phase III, Phase II, and Phase I with Phase II extension studies evaluating chemotherapy (18), targeted therapy (26), immunotherapy (7), and hormonal therapy (2) in recurrent malignant salivary gland tumors [Table 1], [Table 2], [Table 3], [Table 4]. Recurrent/metastatic salivary gland tumors are one of the orphan diseases where, due to a paucity of cases, a large prospective randomized data are unavailable. Routine clinical therapeutic decisions often include single or double chemotherapy with modest responses and remissions which are seldom durable. Several ongoing and few completed clinical trials suggest differential benefit of therapy depending upon histology and biomarker expression. As being a consortium of different histology, patients with salivary gland tumor need much better biomarkers to target molecular drivers by several novel drugs including targeted therapy, androgen blockage, and immunotherapy for improved outcomes. The goal of treatment for recurrent/metastatic salivary gland tumors is palliation. Except for slow-growing asymptomatic disease, majority of patients with symptomatic metastatic disease receive chemotherapy for symptomatic relief although their benefit in survival is equivocal. In the absence of robust Level I evidence, choice of therapy depends on individual physician and institute practice. Despite metastatic disease, majority of patients enjoy better survival as compared to conventional metastatic head and neck squamous cell carcinoma., Hence, it is prudent to use intermittent chemotherapy for palliation of symptomatic progression and interim observation to avoid potential adverse effects. Several chemotherapy agents such as cisplatin, paclitaxel, doxorubicin, methotrexate, epirubicin, gemcitabine, doxorubicin, fluorouracil, cyclophosphamide, mitoxantrone, and vinorelbine have been tried as single agents in recurrent metastatic salivary gland tumors, producing response rates in the range of 15%–20%.,,, Paclitaxel produces better responses in adenocarcinoma and mucoepidermoid carcinoma compared to adenoid cystic carcinoma. Combination chemotherapy such as vinorelbine–cisplatin or cyclophosphamide–adriamycin–cisplatin produces superior response rates in the range of 40%–50% and hence is worth trying in patients with aggressive or high symptom disease for early and effective palliation., When combination of irinotecan and cisplatin was explored in recurrent metastatic head and neck cancer, including salivary gland tumors, it produced overall response rate of 30% with disease control rates of 53%., Ispinesib, a novel spindle protein inhibitor which prevents binding of microtubules, thus inhibiting microtubule assembly leading to cell cycle arrest in M phase, failed to produce any responses in a Phase II clinical trial. Guzzo M, Locati LD, Prott FJ, Gatta G, McGurk M, Licitra L, et al. Major and minor salivary gland tumors. Crit Rev Oncol Hematol 2010;74:134-48. Sur RK, Donde B, Levin V, Pacella J, Kotzen J, Cooper K, et al. Adenoid cystic carcinoma of the salivary glands: A review of 10 years. Laryngoscope 1997;107:1276-80. Yu T, Gao QH, Wang XY, Wen YM, Li LJ. Malignant sublingual gland tumors: A retrospective clinicopathologic study of 28 cases. Oncology 2007;72:39-44. Hill ME, Constenla DO, A'Hern RP, Henk JM, Rhys-Evans P, Breach N, et al. Cisplatin and 5-fluorouracil for symptom control in advanced salivary adenoid cystic carcinoma. Oral Oncol 1997;33:275-8. Available from: https://www.clinicaltrials.gov/. [Last accessed on 2018 Apr 28]. Spiro RH. Distant metastasis in adenoid cystic carcinoma of salivary origin. Am J Surg 1997;174:495-8.
van der Wal JE, Becking AG, Snow GB, van der Waal I. Distant metastases of adenoid cystic carcinoma of the salivary glands and the value of diagnostic examinations during follow-up. Head Neck 2002;24:779-83. Verweij J, de Mulder PH, de Graeff A, Vermorken JB, Wildiers J, Kerger J, et al. Phase II study on mitoxantrone in adenoid cystic carcinomas of the head and neck. EORTC head and neck cancer cooperative group. Ann Oncol 1996;7:867-9. Licitra L, Marchini S, Spinazzè S, Rossi A, Rocca A, Grandi C, et al. Cisplatin in advanced salivary gland carcinoma. A phase II study of 25 patients. Cancer 1991;68:1874-7. Vermorken JB, Verweij J, de Mulder PH, Cognetti F, Clavel M, Rodenhuis S, et al. Epirubicin in patients with advanced or recurrent adenoid cystic carcinoma of the head and neck: A phase II study of the EORTC Head and Neck Cancer Cooperative Group. Ann Oncol 1993;4:785-8. Airoldi M, Pedani F, Succo G, Gabriele AM, Ragona R, Marchionatti S, et al. Phase II randomized trial comparing vinorelbine versus vinorelbine plus cisplatin in patients with recurrent salivary gland malignancies. Cancer 2001;91:541-7. Dreyfuss AI, Clark JR, Fallon BG, Posner MR, Norris CM Jr., Miller D, et al. Cyclophosphamide, doxorubicin, and cisplatin combination chemotherapy for advanced carcinomas of salivary gland origin. Cancer 1987;60:2869-72. Available from: https://www.clinicaltrials.gov/ct2/show/NCT00639769?cond=salivary+gland+tumours&draw=19&rank=169. [Last accessed on 2018 Apr 28]. Gilbert J, Cmelak A, Shyr Y, Netterville J, Burkey BB, Sinard RJ, et al. 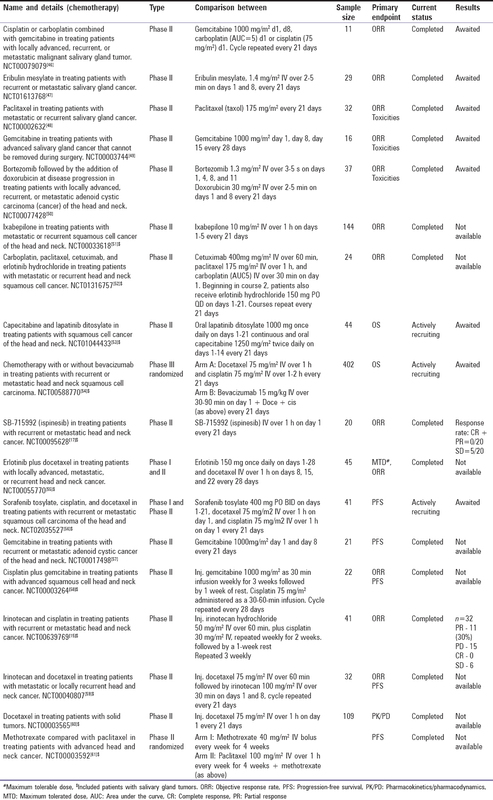 Phase II trial of irinotecan plus cisplatin in patients with recurrent or metastatic squamous carcinoma of the head and neck. Cancer 2008;113:186-92. Available from: https://www.clinicaltrials.gov/ct2/show/results/NCT00095628?cond=salivary+gland+tumours&draw=11&rank=84&sect=X01256#all. [Last accessed on 2018 Apr 28]. Drilon A, Laetsch TW, Kummar S, DuBois SG, Lassen UN, Demetri GD, et al. Efficacy of larotrectinib in TRK fusion-positive cancers in adults and children. N Engl J Med 2018;378:731-9. Glisson B, Colevas AD, Haddad R, Krane J, El-Naggar A, Kies M, et al. HER2 expression in salivary gland carcinomas: Dependence on histological subtype. Clin Cancer Res 2004;10:944-6. Haddad R, Colevas AD, Krane JF, Cooper D, Glisson B, Amrein PC, et al. Herceptin in patients with advanced or metastatic salivary gland carcinomas. A phase II study. Oral Oncol 2003;39:724-7. Available from: https://www.clinicaltrials.gov/ct2/show/NCT00004163?cond=salivary+gland+tumours&draw=5&rank=26. [Last accessed on 2018 Apr 28]. Available from: https://www.clinicaltrials.gov/ct2/show/NCT00114283?cond=salivary+gland+tumours&draw=11&rank=82. [Last accessed on 2018 Apr 28]. Available from: https://www.clinicaltrials.gov/ct2/show/NCT00098631?cond=salivary+gland+tumours&draw=18&rank=154. [Last accessed on 2018 Apr 28]. Mino M, Pilch BZ, Faquin WC. Expression of KIT (CD117) in neoplasms of the head and neck: An ancillary marker for adenoid cystic carcinoma. Mod Pathol 2003;16:1224-31. Pfeffer MR, Talmi Y, Catane R, Symon Z, Yosepovitch A, Levitt M, et al. A phase II study of imatinib for advanced adenoid cystic carcinoma of head and neck salivary glands. Oral Oncol 2007;43:33-6. Wong SJ, Karrison T, Hayes DN, Kies MS, Cullen KJ, Tanvetyanon T, et al. Phase II trial of dasatinib for recurrent or metastatic c-KIT expressing adenoid cystic carcinoma and for nonadenoid cystic malignant salivary tumors. Ann Oncol 2016;27:318-23. Available from: https://www.clinicaltrials.gov/ct2/show/NCT00859937?cond=salivary+gland+tumours&draw=3&rank=8. [Last accessed on 2018 Apr 28]. Available from: https://www.clinicaltrials.gov/ct2/show/results/NCT00507767?cond=salivary+gland+tumours&draw=10&rank=77&sect=X70156#outcome1. [Last accessed on 2018 Apr 28]. Chau NG, Hotte SJ, Chen EX, Chin SF, Turner S, Wang L, et al. A phase II study of sunitinib in recurrent and/or metastatic adenoid cystic carcinoma (ACC) of the salivary glands: Current progress and challenges in evaluating molecularly targeted agents in ACC. Ann Oncol 2012;23:1562-70. Locati LD, Perrone F, Cortelazzi B, Bergamini C, Bossi P, Civelli E, et al. A phase II study of sorafenib in recurrent and/or metastatic salivary gland carcinomas: Translational analyses and clinical impact. Eur J Cancer 2016;69:158-65. Ho AL, Dunn L, Sherman EJ, Fury MG, Baxi SS, Chandramohan R, et al. A phase II study of axitinib (AG-013736) in patients with incurable adenoid cystic carcinoma. Ann Oncol 2016;27:1902-8. Locati LD, Bossi P, Perrone F, Potepan P, Crippa F, Mariani L, et al. Cetuximab in recurrent and/or metastatic salivary gland carcinomas: A phase II study. Oral Oncol 2009;45:574-8. Available from: https://www.clinicaltrials.gov/ct2/show/NCT01256385?cond=salivary+gland+tumours&draw=7&rank=47. [Last accessed on 2018 Apr 28]. Available from: https://www.clinicaltrials.gov/ct2/show/NCT00939627?cond=salivary+gland+tumours&draw=11. [Last accessed on 2018 Apr 28]. Psyrri A, Rampias T, Vermorken JB. The current and future impact of human papillomavirus on treatment of squamous cell carcinoma of the head and neck. Ann Oncol 2014;25:2101-15. Fan CY, Melhem MF, Hosal AS, Grandis JR, Barnes EL. Expression of androgen receptor, epidermal growth factor receptor, and transforming growth factor alpha in salivary duct carcinoma. Arch Otolaryngol Head Neck Surg 2001;127:1075-9. Fushimi C, Tada Y, Takahashi H, Nagao T, Ojiri H, Masubuchi T, et al. A prospective phase II study of combined androgen blockade in patients with androgen receptor-positive metastatic or locally advanced unresectable salivary gland carcinoma. Ann Oncol 2018;29:979-84. Available from: https://www.clinicaltrials.gov/ct2/show/NCT02867852?cond=salivary+gland+tumours&rank=4. [Last accessed on 2018 Apr 28]. Available from: https://www.clinicaltrials.gov/ct2/show/NCT01969578?cond=salivary+gland+tumours&draw=4&rank=14. [Last accessed on 2018 Apr 28]. Available from: https://www.clinicaltrials.gov/ct2/show/NCT03360890?cond=salivary+gland+tumours&rank=5. [Last accessed on 2018 Apr 28]. Available from: https://www.clinicaltrials.gov/ct2/show/NCT03146650?cond=salivary+gland+tumours&draw=2&rank=11. [Last accessed on 2018 Apr 28]. Available from: https://www.clinicaltrials.gov/ct2/show/record/NCT03172624?cond=salivary+gland+tumours&draw=4&rank=17. [Last accessed on 2018 Apr 28]. Available from: https://www.clinicaltrials.gov/ct2/show/NCT03132038?cond=salivary+gland+tumours&draw=6&rank=38. [Last accessed on 2018 Apr 02]. Available from: https://www.clinicaltrials.gov/ct2/show/NCT02538510?cond=salivary+gland+tumours&draw=7&rank=43. [Last accessed on 2018 Apr 02]. Available from: https://www.clinicaltrials.gov/ct2/show/NCT02834013?cond=salivary+gland+tumours&draw=8&rank=57. [Last accessed on 2018 Apr 28]. Available from: https://www.clinicaltrials.gov/ct2/show/record/NCT00079079?cond=salivary+gland+tumours&rank=7. [Last accessed on 2018 Apr 28]. Available from: https://www.clinicaltrials.gov/ct2/show/NCT01613768?cond=salivary+gland+tumours&draw=4&rank=19. [Last accessed on 2018 Apr 28]. Available from: https://www.clinicaltrials.gov/ct2/show/record/NCT00002632?cond=salivary+gland+tumours&draw=5&rank=23. [Last accessed on 2018 Apr 28]. Available from: https://www.clinicaltrials.gov/ct2/show/NCT00003744?cond=salivary+gland+tumours&draw=5&rank=27. [Last accessed on 2018 Apr 28]. Available from: https://www.clinicaltrials.gov/ct2/show/NCT00077428?cond=salivary+gland+tumours&draw=6&rank=33. [Last accessed on 2018 Apr 28]. Available from: https://www.clinicaltrials.gov/ct2/show/NCT00033618?cond=salivary+gland+tumours&draw=9&rank=70. [Last accessed on 2018 Apr 28]. Available from: https://www.clinicaltrials.gov/ct2/show/NCT01316757?cond=salivary+gland+tumours&draw=10&rank=75. [Last accessed on 2018 Apr 28]. Available from: https://www.clinicaltrials.gov/ct2/show/NCT01044433?cond=salivary+gland+tumours&draw=10&rank=78 [last assessed on 2018 Apr 28]. Available from: https://www.clinicaltrials.gov/ct2/show/NCT00588770?cond=salivary+gland+tumours&draw=10. [Last accessed on 2018 Apr 28]. Available from: https://www.clinicaltrials.gov/ct2/show/NCT00055770?cond=salivary+gland+tumours&draw=11&rank=86. [Last accessed on 2018 Apr 28]. Available from: https://www.clinicaltrials.gov/ct2/show/NCT02035527?cond=salivary+gland+tumours&draw=11. [Last accessed on 2018 Apr 28]. Available from: https://www.clinicaltrials.gov/ct2/show/NCT00017498?cond=salivary+gland+tumours&draw=14&rank=117. [Last accessed on 2018 Apr 28]. Available from: https://www.clinicaltrials.gov/ct2/show/NCT00003264?cond=salivary+gland+tumours&draw=19&rank=162. [Last accessed on 2018 Apr 28]. Available from: https://www.clinicaltrials.gov/ct2/show/NCT00040807?cond=salivary+gland+tumours&draw=20&rank=173. [Last accessed on 2018 Apr 28]. Available from: https://www.clinicaltrials.gov/ct2/show/NCT00003565?cond=salivary+gland+tumours&draw=20&rank=180. [Last accessed on 2018 Apr 28]. Available from: https://www.clinicaltrials.gov/ct2/show/NCT00003592?cond=salivary+gland+tumours&draw=21&rank=188. [Last accessed on 2018 Apr 28]. Available from: https://www.clinicaltrials.gov/ct2/show/record/NCT02857712?cond=salivary+gland+tumours&draw=4&rank=15. [Last accessed on 2018 Apr 28]. Available from: https://www.clinicaltrials.gov/ct2/show/results/NCT00509002?cond=salivary+gland+tumours&draw=4&rank=16&sect=X70156#outcome1. [Last accessed on 2018 Apr 28]. Jakob JA, Kies MS, Glisson BS, Kupferman ME, Liu DD, Lee JJ, et al. Phase II study of gefitinib in patients with advanced salivary gland cancers. Head Neck 2015;37:644-9. Available from: https://www.clinicaltrials.gov/ct2/show/results/NCT00095563?cond=salivary+gland+tumours&draw=5&rank=21. [Last accessed on 2018 Apr 28]. Available from: https://www.clinicaltrials.gov/ct2/show/NCT00045669?cond=salivary+gland+tumours&draw=5&rank=25. [Last accessed on 2018 Apr 28]. Available from: https://www.clinicaltrials.gov/ct2/show/record/NCT02393820?cond=salivary+gland+tumours&draw=5&rank=28. [Last accessed on 2018 Apr 28]. Available from: https://www.clinicaltrials.gov/ct2/show/NCT00886132?cond=salivary+gland+tumours&draw=5&rank=30 [last assessed on 2018 Apr 28]. Available from: https://www.clinicaltrials.gov/ct2/show/record/NCT01678105?cond=salivary+gland+tumours&draw=6&rank=31. [Last accessed on 2018 Apr 28]. Available from: https://www.clinicaltrials.gov/ct2/show/NCT02860936?cond=salivary+gland+tumours&draw=6&rank=32. [Last accessed on 2018 Apr 28]. Available from: https://www.clinicaltrials.gov/ct2/show/NCT01604772?cond=salivary+gland+tumours&draw=6&rank=34. [Last accessed on 2018 Apr 28]. Available from: https://www.clinicaltrials.gov/ct2/show/NCT01175980?cond=salivary+gland+tumours&draw=6&rank=35. [Last accessed on 2018 Apr 28]. Available from: https://www.clinicaltrials.gov/ct2/show/NCT02576431?cond=salivary+gland+tumours&draw=6&rank=36. [Last accessed on 2018 Apr 28]. Available from: https://www.clinicaltrials.gov/ct2/show/NCT03215511?cond=salivary+gland+tumours&draw=6&rank=37. [Last accessed on 2018 Apr 28]. Available from: https://www.clinicaltrials.gov/ct2/show/NCT02568267?cond=salivary+gland+tumours&draw=7&rank=48. [Last accessed on 2018 Apr 28]. Available from: https://www.clinicaltrials.gov/ct2/show/NCT00458978?cond=salivary+gland+tumours&draw=7&rank=49. [Last accessed on 2018 Apr 28]. Available from: https://www.clinicaltrials.gov/ct2/show/NCT01816984?cond=salivary+gland+tumours&draw=9&rank=61. [Last accessed on 2018 Apr 28]. Available from: https://www.clinicaltrials.gov/ct2/show/NCT00096512?cond=salivary+gland+tumours&draw=9&rank=65. [Last accessed on 2018 Apr 28]. Available from: https://www.clinicaltrials.gov/ct2/show/NCT00068497?cond=salivary+gland+tumours&draw=9&rank=69. [Last accessed on 2018 Apr 28]. Available from: https://www.clinicaltrials.gov/ct2/show/NCT00101348?cond=salivary+gland+tumours&draw=11&rank=85. [Last accessed on 2018 Apr 28]. Available from: https://www.clinicaltrials.gov/ct2/show/NCT00055913?cond=salivary+gland+tumours&draw=15&rank=128. [Last accessed on 2018 Apr 28].